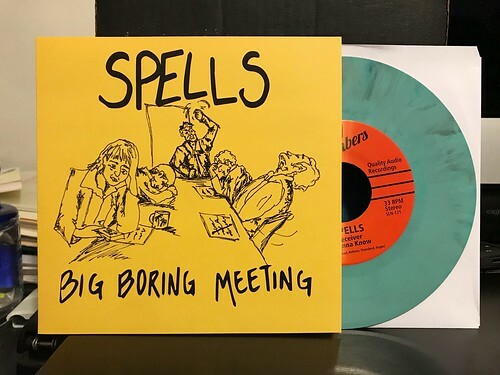 I Buy Way Too Many Records Dot Com: Spells - Big Boring Meeting 7"
I was pretty excited about a new Spells 7" coming in the mail. They've been a really consistent band the last few years and I've dug everything they've released so far. This new 7" is no exception and boy did they cram as much stuff as they possibly could on to this guy. On the A side we have two songs, "Deceiver" and "I Wanna Know." I've described Spells as something of a party band that I think has a Rocket From The Crypt-esque vibe to them and I still feel that way. That's not to say I think their music sounds super similar, but they have the same sort of attitude and can churn out some garage-y hits. In particular "I Wanna Know" with its snake charmer lead guitar riff is one of the top songs in this batch. On the B side, Spells cram in four short brief songs. I don't think any of them live up to the heights set up on the A side, but I've got to say "She Wants To Die Before I Do" is damn catchy. I kind of wish they explored that one a little more instead of cutting out at the one minute mark. I still think Spells sound like they'd be a hell of a lot of fun live, someone let me know if they hit the East Coast.